On this 788-kilometre ride you’ll cycle on paved roads in good condition through farming villages, up and over lush green mountains and on winding roads along the Mekong River. Our cycling starts in the former Lanna Kingdom of Chiang Rai. We will be alternating between hilly and flat days, but we always start off with a gentle ride before we start climbing. After a loop through some of the best scenery of northern Thailand, we finish in the adventure capital of Chiang Mai. The trip is fully supported and your guide’s expert knowledge of the area and terrain means that you always know what is coming up in terms of distance and difficulty. We meet in the afternoon in Chiang Rai for a warm-up ride through rice paddy fields along the Mae Lao River to the distinctive White Temple created by a local artist. Then head back to the hotel to refresh for an outing to the night bazaar and dinner. Climbing the hills of Wawee, we have a nice 40 km flat stretch to warm up before the serious stuff. Enjoying panoramic views, we take a fast 10-km descent and ride on quiet roads to Thaton. We won't be pedalling very hard until KM 25. Then it's a climb, but we only gain about 350 m over 10 km. We ride past farmers working their fields and be greeted by children and possibly a water buffalo or two. It's a semi rest day with a quiet morning flat ride along the Mekong River. We arrive Chiang Khong in time for you to relax on your balcony, visit the local market, or wander through the bicycle museum. Riding out of Chiang Khong we head south to Pu Chi Fah for a stunning viewpoint. After a 40-km warm-up, we ascend over 2,000 m, finishing atop an amazing cliff formation like no other in the region. We start with an exhilarating descent down the mountain and then the ride flattens out as we cycle through a wide and fertile valley. We end our ride in Phayao Lake with time to chill in this laid-back town. We ride around the lake and ascend over into the next valley by crossing a mountain range. As the light turns golden we'll ride through the foothills of the forested mountains and into the paddy fields. Today's ride ends with a waterfall, but we have our work cut out for us! We'll be cycling up to 1,400 m. The climbs will be tough, but they won't be unrelenting. Loop around Doi Suthep, the mountain overlooking this ancient city, and head for lunch at Samoeng. Riding around the mountain, we have one tough rise before enjoying a swift downhill. Relax and rest after nine days of great riding. Day 1 - Chiang Rai Ride 30km. +129m / -129m. Challenging cycling but well managed by guides with drink stops and some easier days. Cycling was on quiet and well maintained roads with lots of attractive mountain scenery. Hotels of a generally good standard considering some remote locations. Lots of good food although probably not to as high a standard as you would get in big towns. Small group of 3 made the logistics very easy especially as we were of similar cycling ability, however, support was always in the right place in case it was needed. The tour was challenging and delightful. Sert, Pong and Rong did everything possible to be sure the riders were safe and well-taken care of. We would highly recommend Spice Roads! Tremendous guide in Prasert (Sert). He had a unique blend of enthusiasm, humor, support, and overwhelming motivation to be sure we were satisfied with all aspects of the trip. This tour is 100% on road, and we designed the route with road bikers in mind. We start in Chiang Rai with a warm-up ride to get used to your bikes, then the riding begins in earnest. We will be alternating between hilly and flat days, but we always start off with a gentle ride before we start climbing. The total distance is 788 km in nine riding days on smooth tarmac roads. Some of the distances are quite long, and there are significant ascents and a few steep sections on some days, but there are also a few flat days to let your legs recover. The trip is fully supported, and your guide’s expert knowledge of the area and terrain means that you always know what is coming up in terms of distance and difficulty. This makes a tremendous difference, as does the constant supply of cold drinks, ice, and fresh fruit. Suitability: This is a tour for cyclists possessing a moderate to high level of physical fitness. Fitness will be a huge asset on those long days and on the undulating hills. The tour is fully supported, and the bus is always close at hand for those who find the riding too difficult. Biking Conditions: We ride between 30 and 125 km a day. We built in some easy half-day rides, but the daily ascents range from 129 to 2,000 m. The roads are 100% tarmac and in good condition. We meet in the afternoon for a warm-up ride to make sure the bikes fit. Our nice and easy ride through the outskirts of the city will also get us accustomed to riding in Thailand and on the left side of the road. We cycle through rice paddy fields and follow the Mae Lao River to the exquisite Wat Rong Khun, the White Temple. Created by Thailand's National Artist Chalermchai Kositpipat, this temple stands out for its distinctive style. After the visit, we head back to the hotel, so we can refresh before an outing to the night bazaar and dinner. Today we will be heading up to the hills of Wawee, but we have a nice fast flat stretch of 40 km to warm up our legs before the real work begins. 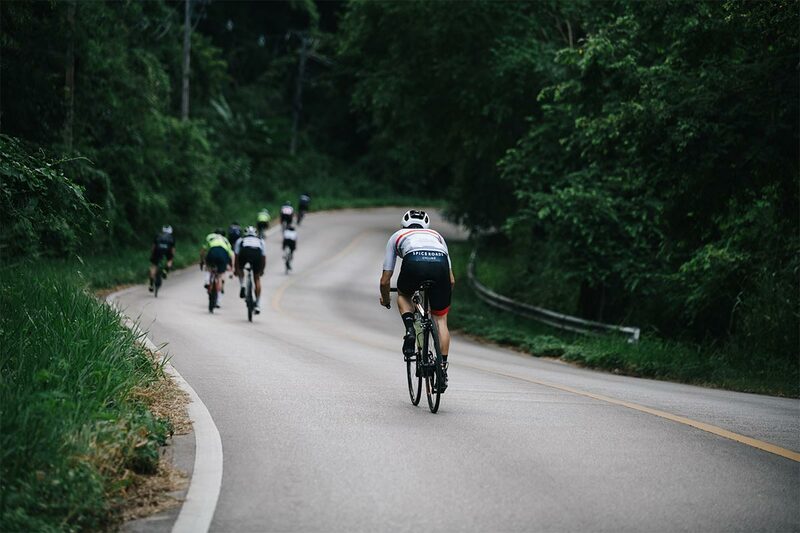 The first climb is through a variety of fields from sugar cane to maize, small farming villages, and endless mountain views, enough to distract you from the effort of ascending 800 m in just 15 kilometres! We stop for a scenic rest stop with panoramic views before a fast 10-km descent. The remainder of ride will be undulating on quiet roads in good condition. We end at Thaton along the banks of the Maekok River where your resort with a swimming pool awaits. We'll have ascended almost 2,000 m in 123 km, a respectable first day! We have a gentle start to the day as we won't be pushing the pedals very hard until kilometre 25. Then it's time to climb, but we only gain about 350 m over 10 km, for which we are rewarded with a short downhill and another climb. During our cycle, we'll pass hilltribe farmers working their fields and be greeted by children and possibly a water buffalo or two. Our true reward will be the long, gentle descent all the way to the town of Chaing Saen on the banks of the Mekong River. This town dates to the 7th century; however, it was around 1328 that the city walls, which are still standing, were built. Our hotel is directly on the river and overlooks Laos on the other side. Our total vertical climb today is 800 m.
Today is a semi rest day as we have a fast, flat ride in the morning, leaving the afternoon free for you to relax. Our ride today is along the Mekong River, which also forms the border with Laos, on a quiet, smooth road. We arrive in the border town of Chiang Khong in time for lunch, and the afternoon is free for you to sit on your balcony overlooking the river, explore the local market, or take a wander through the bicycle museum. Dinner is on your own tonight. We ride out of Chiang Khong and head south to Pu Chi Fa for a stunning viewpoint. We warm up for 50 km on a leisurely level route and then it's time to go up, up, up. We rest after the first ascent of almost 800 m up to a plateau. Here we'll have a few undulations along a ridge at 1,200 m to our resort. The mountains here have a patchwork of fields growing a large variety of crops, from cabbage and corn to strawberries to lychee farmed by Hmong. Tonight, you can enjoy fresh cool air in your cosy bungalow. What goes up must come down. We start with an exhilarating descent down the mountain, and then the ride flattens out as we cycle through a wide and fertile valley. We stop for a break at Phu Sang Waterfall, where the water comes from a hot spring with water temperature around 33-35 degrees. The riding from here on is flat with just a few rises. We cycle on to have lunch in the small town of Chun and then finish at the lakeside town of Phayao. We pass many small towns and villages and see locals going about their daily business as they herd their cattle or till their fields. We end our ride at Phayao Lake, an artificial lake that is now home to more than 22 species of fish. The town is very laid-back, and after checking into our hotel, we'll head to a lakeside restaurant for a feast. This morning, we ride around the lake before we start our first serious climb of the day, a 11-km ascent. We top out just under 1,000 m after a climb of 500 m or so and have views back into the valley we left. Looking ahead, we enjoy our downhill, with a stop to take photos at Tan Tong Waterfall. After lunch, we get back on our bikes and cross in-to the next valley by crossing a small mountain range. Our ride ends with a flat ride through rice paddies. We stay in a funky resort with individual artwork in each room. Today's ride has a refreshing end in a waterfall, but before we get there, we have our work cut out for us! We'll be cycling up to 1,400 m, and though the climbs will be tough, they won't be unrelenting. The road winds up through a lush forest, and you'll hear birds seemingly encouraging you on. After a break at the top, a freewheel of 20 km awaits! Our scenic ride continues through rice fields and orchards filled with exotic fruits. We arrive at Bua Thong Waterfall where we can have a dip in the crystal clear water, but watch out for the freshwater crabs! We then transfer one hour to Chiang Mai and our centrally located ho-tel. Our loop takes us around Doi Suthep, the mountain that overlooks the old city. We have a very short transfer out of Chiang Mai to avoid traffic. We start pedalling on quiet country roads with lots of coffee places to stop at along the way. We have one major climb in the morning, which will be after a descent with some sharp curves. We stop for lunch at the village of Samoeng. As we come around the mountain, we have one more tough rise, but once over the top, it's downhill to the fertile foothills north of Chiang Mai. Back to the hotel to clean up and prepare for our farewell dinner. Today is yours to relax and rest after nine days of great riding. We can help with arrangements if you’d like to extend your stay in Thailand or organise transfers to the airport for onward flights. Because some people can't imagine going on a trip without their own beloved bicycle, we do not provide them as part of this tour. However, you can hire bikes locally for the price listed in the tour pricing section. The bikes are Trek 2.1 C, Domane 2.0 and carbon Émonda S5 road bikes, with Shimano components and seat posts. If you have your own saddle that you are comfortable with, you are welcome to bring it and we'll fit it. We can provide strap-styled toe cages if requested, but you might like to consider bringing SPD clip pedals if you use them, and please make sure to bring your shoes and cleats. If you bring your own bike, please make sure it is a road bike in good mechanical order.